Flex: I noticed the flex was stiffer than last year’s V-rocker and not as playful but it made up for it with stability and charging the runs. Softer flex between the feet, tad stiffer tip and tail and stiffer underfoot where the camber zones were located. It was still easy to torsionally flex the board and you got quick edge to edge response but once on edge, the carbon I-beam helped it rally through a carve with stability. It felt more like a freeride board than in previous years but with a all mountain handling. The Flying V gives it reverse camber, V-rocker between the feet, underneath your feet are camber zones and rocker outside your feet to the tip and tail. Turning: My notes had a couple exclamation points when it came to carving, the feelgood flying V was quick edge to edge and once on edge, you could really power through a carve on the slopes. It really held an edge through S turns and if you wanted shorter quick turns the feelgood had no problems with giving them to you. It was very stable each turn and I never felt the board wash out of a turn. It definitely impressed for it’s carving handling on the mountain especially in some of the more hardpacked/icy spots. Stable: The switch to Flying V definitely made the Feelgood a lot more stable of a ride down the mountain with the mix of reverse camber. Through some choppy conditions, it charged and never felt bounced around. On icy spots, it held an edge and you never felt it lose it’s stability in the sketchy stuff. Pop: Good amount of pop in the tail and with the flying V which came in handy for halfpipe and popping ollies off the rollers. The addition of flying V made it more stable and better pop than the V-rocker. In the park and playing around, still able to butter and press but wasn’t as easy as V-rocker. Switch: The feelgood flying V has a directional shape but twin flex. Riding switch had a little catchiness but overall just something to adjust to and still very capable of riding switch down the mountain. Overall Impression: Welcome to the next generation of feelgood riders, all mountain handling that you can take from pow to the park with no limitations. The feelgood with flying V was a perfect match and it gave the board some added perks to improving the ride for women. 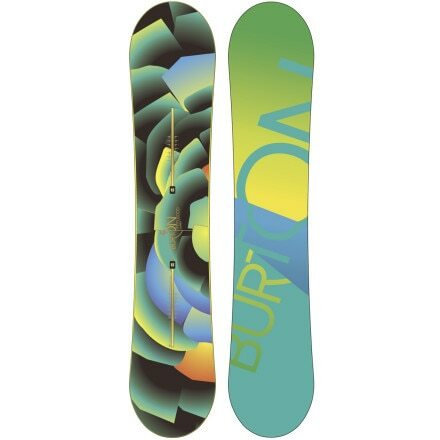 Shay’s Honesty Box: So far this has been a favorite women’s board for all mountain handling and riding. It definitely made me finally love the Flying V and feel like it was a great way to enhance the feelgood legacy.